Be the first to share your favorite memory, photo or story of Beaulah. This memorial page is dedicated for family, friends and future generations to celebrate the life of their loved one. Beulah May Trainor, 93, formally of Mt. 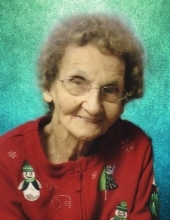 Pleasant, died Monday, January 21, 2019 at the Martha T. Berry Medical Facility in Mt. Clemens. The family will receive friends from 12-2 p.m. on Friday, January 25, at Charles R. Lux Family Funeral Home in Mt. Pleasant. Interment will follow at Memorial Gardens Cemetery. Beulah was born June 24, 1925, in Brown City, Michigan, daughter of the late Clifford and Pearl (Davis) Cummings. She married John A. Trainor on September 17, 1943, in Brown City, Michigan. Beulah was a member of the Rosebush Baptist Church and enjoyed solving puzzles. She is survived by three sons. William (Barbara) Trainor of Temperance, Terry (Dawn) Trainor of Waterford, and Darryl (Wanita) Trainor of Mt. Pleasant; 11 grandchildren; 10 great grandchildren; brother, Charles (Bonnie) Cummings of Kingston; and several nieces and nephews. Beulah was preceded in death by her parents, Clifford and Pearl Cummings; husband, John Trainor; sons, Robert Trainor and Donald Trainor; brothers, Eugene, Howard, Jay, Donald, and Bernard Cummings; and sister, Geraldine Stephenson. To send flowers or a remembrance gift to the family of Beaulah May Trainor, please visit our Tribute Store. "Email Address" would like to share the life celebration of Beaulah May Trainor. Click on the "link" to go to share a favorite memory or leave a condolence message for the family.